Welcome to the Ultimate Guide to Marketing Transformation, a set of tutorials, tips, and toolkits to help CMOs (Chief Marketing Officers) and the marketing transformation teams to plan, implement and harness the benefits of transforming their marketing functions for the digital and cognitive age. Marketing functions are no longer the realm of dreamy-eyed creative types conjuring up advertising magic (of course, artistic talent is still essential and integral to marketing success.) The current marketing function, particularly in this digital age, is a strategic, analytical, operational, and real-time endeavor as much as it is a creative exercise. Enterprise digital marketing transformation is not an easy task. So, to help the teams embarking on remaking the marketing function, CIOPages has come up with a comprehensive and in-depth marketing transformation guide to help in this mission-critical endeavor. Let’s dive deeper into each of these sections. CIOPages.com defines Marketing Transformation as a strategic, structural, and systemic change encompassing the re-envisioning of the marketing operating model, restructuring the marketing organization, re-engineering of the core marketing processes, enabling new marketing capabilities, and very often re-platforming of the marketing software systems. Digital marketing transformation is not a minor facelift but a paradigm shift in structure, systems, operating model, culture, people, and roles. A band-aid or a paint job will not do the trick. Remaking the marketing value stream for the digital and cognitive age implies a focus on not only the range and quality of marketing services, but also how various stakeholders experience such services. Customers who experience services from digital natives expect nothing less from large firms. The new, new way acknowledges the central role a marketing organization plays in enabling and driving business responsiveness to the radical and swift changes in the broader ecosystem. Marketing Vision and Strategy: What are the north star and highest aspirations from the marketing function? Marketing Operating Model: A blueprint of how the future state marketing organization functions. Marketing Capabilities: What are the core marketing capabilities which are a part of transformation – existing as well as emerging. Marketing Structure and People: What is the best organizational model to structure the future marketing staff? Marketing Value Streams and Processes: Which marketing value streams and processes will change a part of the future state? Marketing Data Model: What data will power the marketing function? Marketing Technology Platforms: What new marketing software and platforms will power the future of marketing? Marketing Governance and Controls: The governance structure, policies, procedures, and controls for managing the marketing function of the future. Marketing Metrics and Measures: How do you measure the success of marketing activities and outcomes? In large enterprises, a well-defined process and flawless execution are essential to making a large marketing transformation program successful. Here are the high-level process steps to attain the goal of transformational marketing within reach. In the digital era, marketing transformation remains a critical driving force in powering organic growth. There are several drivers – both internal and external – which necessitate transforming the marketing function. At a fundamental level, transformational marketing is essential to corporate success in the digital age and hence transforming the marketing function is a strategic imperative. Digital marketing transformation is on the executive agenda of most CMOs. Here are a few strategic imperatives for any enterprise to consider to help make a restructuring and transformation decision of the Marketing function and related systems. Marketing is still mostly a manual process, and the few systems that support marketing processes are disjointed, siloed and complex. You have more digital marketing solutions than the marketing team members. Usage of digital marketing techniques and approaches are random, isolated, and not scalable. Marketing teams need to log into multiple systems to accomplish basic tasks. Multiple and point solutions galore for various Marketing functions. Marketing does not exist in isolation, and it is not an island. The marketing vision should strengthen and support the company vision. Marketing, all is said and done, is a vital but yet a support function and exists to further corporate objectives. Hence, the transformation of marketing and the corresponding vision will always be in conjunction with and support of the company vision. However, to motivate the team, a higher level aspiration and north star are essential to drive the marketing transformation. Orchestrate an integrated and cohesive marketing program to enhance our brand equity, leverage all channels to spread the word about our products and services, and elevate the experience of stakeholders whom we touch. This vision statement is aspirational, motivational, and hence can rally the team around. Of course, it is not about highfalutin words and phrases but what marketing transformation means with the corporate context. Once you have a meaningful vision, then you will need to fill in the specifics such as the goals, objectives, strategy, and initiatives. The strategies to achieve the marketing vision should be actionable and have the ability to move the needle. The initiatives are a part of the overall marketing transformation roadmap which includes a logical grouping of projects that helps move the firm along the transformation journey. 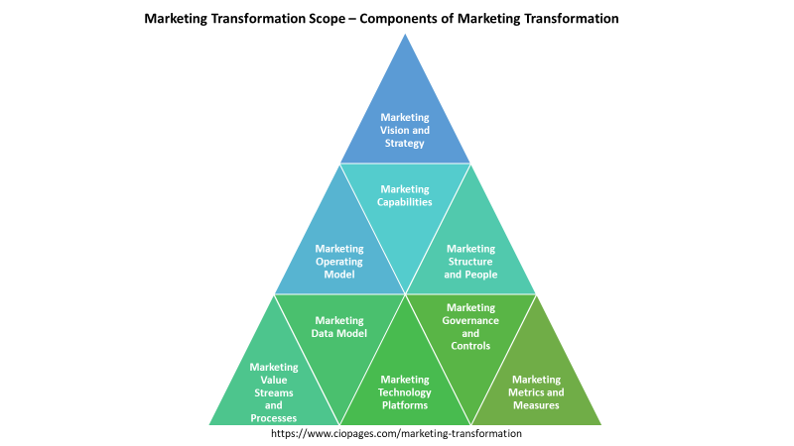 CIOPages.com Marketing Transformation Framework is a cohesive and straightforward approach to planning and executing a fundamental shift in how marketing needs to adapt to the demands of the digital age. 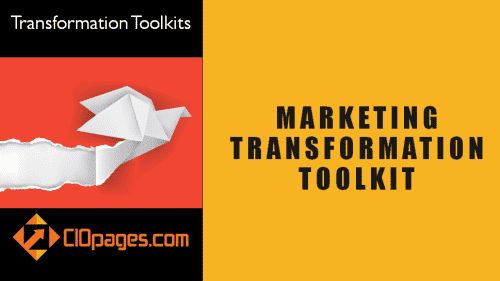 Before we dissect the components of the Digital Marketing Transformation Framework briefly, please also note that CIOPages.com offers a comprehensive and customizable Marketing Transformation Toolkit. Transforming marketing function is a non-trivial task, mainly it involves transformation involving the operating model, the critical value streams and processes, people and their roles. CIOPages.com Marketing Transformation Framework starts with understanding the strategic context of the proposed transformation. This will involve understanding the business needs and corporate objectives, the future vision of the company and the expectations from marketing. Executive Intent details the goals, objectives and desired outcomes as well as the level of support for the marketing transformation endeavor. You may want to create a stakeholder map to capture the level of interest, influence, and intent of various stakeholders. The transformation charter is a concise but a coherent summary of what problems the firm is trying to solve for and the desired outcomes from the transformation endeavor. It is not a detailed business case or a project charter, but a higher-level document. Macro trends: These are global and national events shaping the economy, industry, and the society at large, which in turn will impact the company. These can range from demographics to social mores, globalization to environmental considerations, from geopolitical events to labor movement. One can capture these in a PESTLE analysis. Competitive Dynamics: These factors are typical competitive analysis and should include not only the direct competitors, but indirect competitors, emerging non-traditional competitors who may upend the industry, and others. A competitive analysis framework such as Michael Porter’s Five Forces Model might be useful. Technology Advances: What technologies are driving the marketing transformation? Think digital. Think of cognitive techniques. Also, there may be others which may be impacting the marketing value streams in your particular industry. Internal Challenges: The internal challenges are all the current state problems that the firm is facing in the marketing operations. These items comprise all the breakdowns, service recovery items, process bottlenecks, data inaccuracies, delays, silos, cumbersome processes, etc. Candidate Value Streams: The candidate value streams address the scope and enormity of the transformation challenge by identifying end-to-end marketing value streams of the company. It depends on how big of a transformation your company is undertaking, but typically the value streams could be a prospect to the acquisition, Fulfillment to Delight and Repurchase, Customer Insight to Action, Concept to Creative Execution, etc. 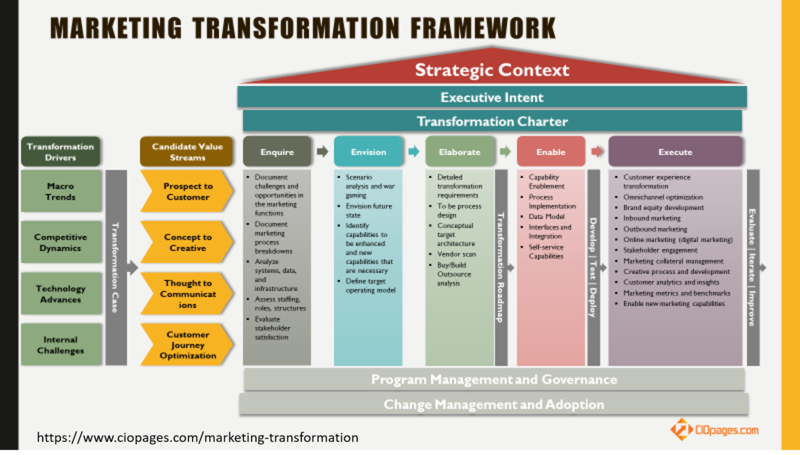 CIOPages.com Marketing Transformation Framework outlines six steps in implementing a transformation program. Enquire – Understand the current state issues, challenges, and impediments. Envision – Paint a picture of the future without being encumbered by the current state. Elaborate – Drill down into what needs to be done, how it needs to get done in greater detail. Enable – This is where the rubber hits the road as in actually implementing the changes envisaged in the digital marketing transformation. Execute – This step involves operating the new generation functions/operations included in and implemented as a part of the transformation framework. Evaluate – This addresses the concept of measuring the critical success factors and key performance indicators and using that learning to improve the marketing function iteratively and incrementally after the transformation. Needless to add no transformation framework is complete or will be successful without program management and governance. This includes the way the project is funded, the steering committees who are accountable, the governance framework, the PMO office, as well as projects and work streams. 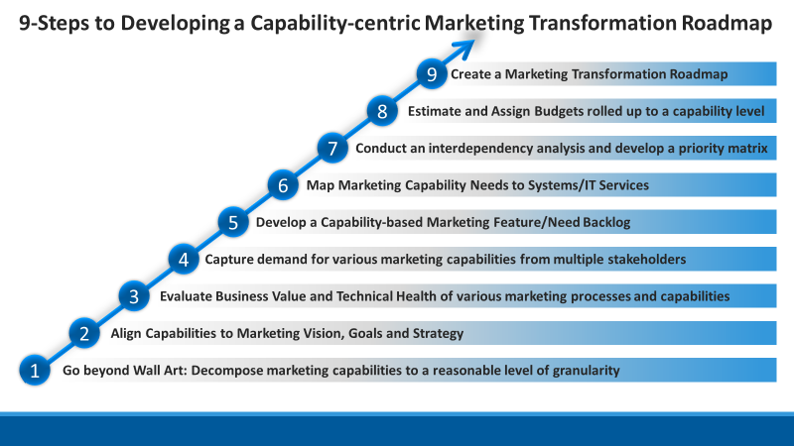 Should you need it, CIOPages.com offers a pre-built and customizable marketing transformation project plan. A marketing transformation change management plan is a paramount consideration in any transformation endeavor. Hence, the project team should include change management as an integral part of the transformation and not as an afterthought. Many large programs fail because of underestimating or underfunding the change effort. 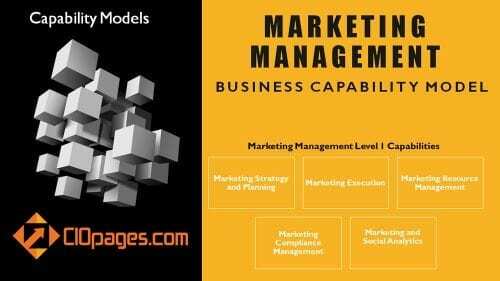 Marketing capabilities list or marketing capabilities model is a distinctive term that is a part of the business architecture realm. We all tend to use the word capability to mean many of the other things on the list, but to be clear, a marketing capability is what marketing does and has the ability to do. While the definition of marketing business capabilities is beyond the scope of this post, other insights are addressing these matters. A marketing business capabilities model is a logical and increasingly granular decomposition of marketing and related functions into a coherent and cohesive list. A marketing capabilities framework generally starts at a coarse grain level and then drills down into more granular elemental entities. Let’s look into an example of a sample marketing capabilities framework, which shows a sliver of marketing capabilities decomposition into lower levels. As you can see, level 1 marketing capabilities are super high level. 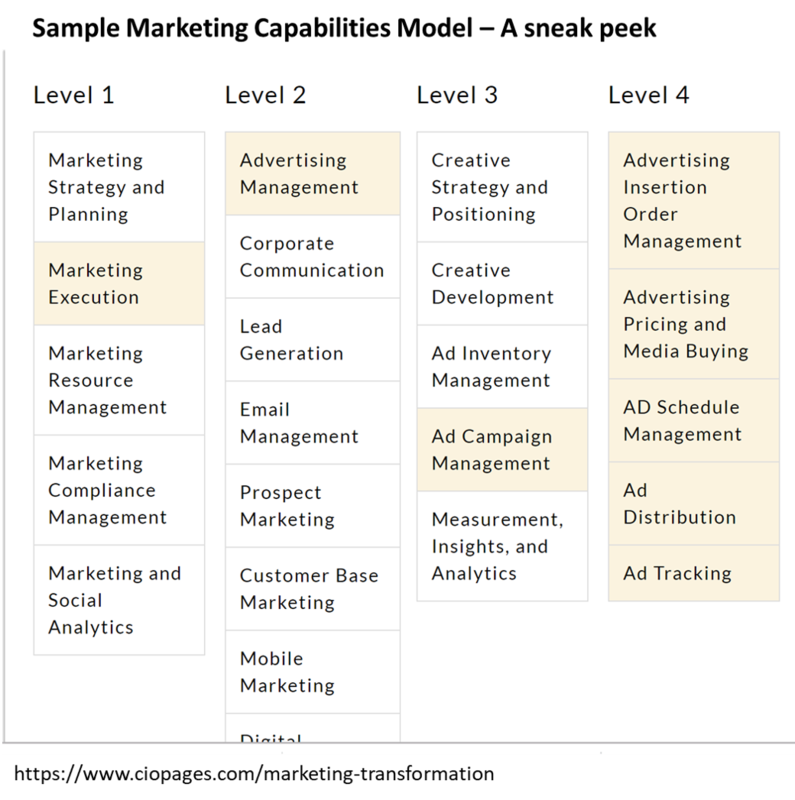 Then level 2 marketing starts to be a bit more detailed and fine-grained. Then levels 3, 4, and 5 (if applicable) provide more the operational details and execution level content. The goal of a marketing capabilities list is to gain a holistic perspective of what is marketing and the various underlying Lego blocks that constitute the whole edifice. The range and depth of marketing capabilities depend on the firm and the sector it operates, the competitive dynamics, and the sales mode. Learn more about marketing capabilities and purchase a comprehensive and integrated marketing capability model. Marketing competencies are the inherent and innate set of behaviors required to drive marketing outcomes. In general, competency is defined by Wikipedia as “A competency is a set of defined behaviors that provide a structured guide enabling the identification, evaluation, and development of the behaviors in individual employees.” For example, many competencies are generic, such as “teamwork” or “leadership,” and are useful not only in marketing but across the board. However, some competencies are more relevant to marketing, such as “creativity” or “storytelling,” or “cultural awareness” etc. Marketing skills are the more technical abilities required to execute marketing strategies and operations. These skills are necessary for understanding the nature of the job and excel in it. For example, SEO (Search engine optimization) is a technical skill required to succeed in a digital marketing role. Another is “Copywriting” which is an ability to capture the essence of marketing message into concise and compelling statements. Marketing features are functions or modules that one needs in a marketing software or platform. The IEEE defined a software feature as, “A distinguishing characteristic of a software item (e.g., performance, portability, or functionality).” A marketing feature could be something like “Account-based marketing” in a CRM software platform. Of course, marketing culture is the foundation of any enterprise is a set of beliefs, behaviors, values, and approach that determine how marketing works in a firm. Now that we are clear on what marketing capabilities, competencies, skills, features, and culture mean, let’s go and transform marketing to meet the enterprise needs in the digital age. A marketing transformation roadmap is a compass for how to realize the transformation vision for marketing through a series of projects, phases, milestones, and releases. The marketing transformation roadmap is a critical deliverable, and it should be more granular than a marketing strategy document and a bit more abstract than a detailed marketing project plan. The marketing transformation roadmap work is more brass stacks and happens after a marketing vision, operating model, and strategy are already clearly articulated. The roadmap is how the concept gets turned into a reality. The following are nine critical steps to building a digital marketing roadmap. Build a backlog aligned to capabilities. What this means is whatever needs and requirements – the voice of the customer, capability gaps, future vision – are defined, they will need to be anchored at a marketing capability level. Mapping marketing capability needs to systems/services (Micro or SOA) is a critical success factor and is a part of the solution design/definition work. This will allow for building services at the right level of granularity or finding the application with the right fit. The marketing roadmap for digitalization typically comprises of broad themes which are in turn are a set of features, functions, and clusters of capabilities with phases, and milestones along the capability-enablement lifecycle. The marketing implementation roadmap is typically very detailed for one quarter and a bit higher level for the following three quarters, and then more at a feature/function level for the subsequent 12 months. Capstera.com has a good definition of a general enterprise Target Operating model. If we apply this concept of a target operating model to a future state marketing operating model, what we will need is a blueprint of what, how, where, when, and who of marketing in the desired target state. So, we will need to envision that point of arrival (POA) and imagine what the steady state will mean – regarding structure, capabilities, process, people, systems, culture, and operations. Detail out how various component of a marketing operating model will function in the future. The components generally include organizational structure, product/service portfolio, business and revenue models, operations, technology, and staffing. Identify strategic and operational levers that will substantially boost the future state operating model. Create a robust change management program and get ready for the future, starting now. Detailed project plans are essential and integral ingredients of making any program or project successful. Without a project plan, it is impossible to manage all the moving parts and people in a transformation project. 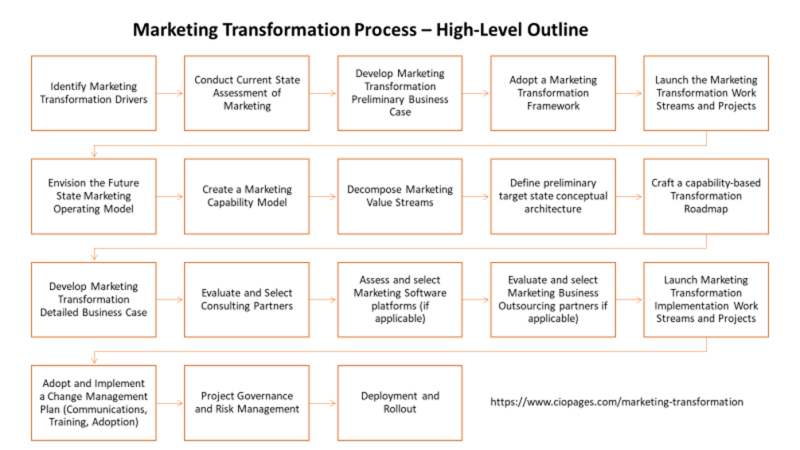 CIOPages.com offers a pre-built and customizable marketing transformation project plan. Typically, there are two project plans – a business project plan, a technology project plan, and sometimes an integrated project plan spanning both business and technology. Startup: The conceptual phase of the marketing transformation. Planning: Vision and planning phase of marketing transformation. Definition: In this phase, teams will define in detail what transformation entails and how the activities manifest. Design: The design phase includes solution planning, systems analysis, and technology design. Development/Integration/Configuration: The actual development of the project solution and the integration with other systems and configuration. Deployment: The rollout to various user groups including training, communication, change management, implementation, and other plans. Go Live: The checklist for going live and the aftermath. Change Management should be an integral part of marketing transformation. Otherwise, it is likely that the benefits would not accrue and user dissatisfaction will derail the future. Hence, it is essential to create a comprehensive and cohesive marketing transformation change management plan. Research indicates that over 70% of large-scale IT transformation projects fail or underperform. Hence, thinking about how to manage change even before the actual transformation unfolds is a critical success factor. More than any other internal functional transformation, marketing transformation is a more complicated endeavor given the stakeholders it impacts and the implications for business success. You can learn more about Change Management here. CIOPages.com recommends using one of the change management models. In particular, we think a change management framework designed for the digital age is an excellent anchor. Analytics everywhere is the new credo and helps in making interactions and transactions measurable. Predictive analytics helps anticipate customer needs. Endless personalization is no longer a dream, but an infinite possibility. Machine learning, artificial intelligence, and other cognitive technologies provide a boost to understanding and reinforcing the marketing value proposition. All aspects of marketing from creative development to marketing operations, from inbound marketing to outbound marketing, from broadcasting to narrowcasting and account-based marketing, from brand equity development to social media engagement – all will work in unison. The collateral, communication templates, brand guidelines, and every other content will be accessible across the marketing value chain to stakeholders. The general challenge of marketing historically has been its inability to codify the wisdom and best practices. After a digital marketing transformation, it is possible to do so. With a single source of truth combined with measures of efficacy, leveraging what works and refining it will be easier. Any good marketing ideas from any part of the world will be available for other regions to harness, adapt, and deploy. Lack of clarity in future vision: Without a clear vision, a marketing transformation effort will be akin to a band-aid or a lipstick job. Lack of executive support and commitment: Senior company leadership must be fully behind the transformation effort. Otherwise, transforming marketing function will become just another project and a side job for a few. Unrealistic expectations: A bottom up and top down the transformation of the marketing function is long, invasive, and involved. So, don’t set yourselves up for failure with unrealistic numbers – dates, budgets, and people. Lack of a clear strategy and transformation framework: Without a cohesive and integration marketing transformation framework, it is difficult to fathom the holistic picture. Underestimating the challenge of data migration: While all the focus is on shiny new toys (read new software), many underestimate or completely ignore the data migration challenge. Understaffing or staffing with “available” resources: If it is a true transformation endeavor, allocate your “A” people and staff the program adequately. Understaffing and often with who is available is an absolute failure risk. Not addressing change management and marketing culture: Marketing transformation is not just about systems and processes, but more about the staff and the culture. So, change management has to be an integral component of the marketing transformation planning. Not thinking through the marketing tech stack and solutions landscape: Buying and bolting on a diverse and disparate set of software will not make the task of marketing any easier, and the complexity of the future landscape will crumble under its weight. Hence, the business architecture, capability planning, and technical and solution architecture teams must determine the ideal target state tech stack and assemble the pieces appropriately. Boiling the ocean: While transformations need to be big and bold, boiling the ocean all at once is not going to work. A marketing transformation roadmap must be incremental, sequential, and focus on quick wins to motivate the team and offer the taste of transformation early and often. The digital and cognitive technology revolution is transforming the art, craft, and science of marketing. Here are a few technologies that are making marketing faster, better, and smarter. Mobility: The preponderance of smartphones, tablets, and ubiquity of broadband has been a game changer for marketing. The form factor combined with anywhere and anytime paradigm will continue to raise the stakes for marketers. Cloud: The SAAS revolution has heralded a wave of marketing technology startups changing the nature of automation and digitalization of marketing. Embracing the cloud is a core tenet of marketing transformation. IOT (Internet of Things): With connected devices, marketers will get access to unprecedented input data as well as leveraging these connected devices as channels of communication. Big Data and Analytics: The harnessing of both internal and external data, in their native formats, and gleaning insights from the diverse data sets have had a transformative impact on marketing. Behavioral modeling, segmentation, predictive analytics et al. are now powering many marketing endeavors. Chatbots and Voice-powered NLP Agents: Intelligent voice agents and chatbots are everywhere, and their prominence will only grow. Marketers have to work in conjunction with technologists to weave in the marketing themes and hooks into these conversations. Machine Learning and Artificial Intelligence: The era of machine learning and artificial intelligence is just beginning but has already had a significant impact in some areas of marketing including client acquisition, intelligent segmentation, analytics to predict the propensity to buy and churn, etc. Augmented and Virtual Reality: Augmented reality and virtual reality are another media of great potential for marketing teams. Call it a renaissance or revolution, the marketing software landscape has witnessed epochal growth in the last decade. Startups of every color and stripe have come to occupy every niche in the marketing spectrum. Scott Brinker of ChiefMartec documented 6,829 marketing technology solutions from 6,242 unique marketing technology vendors in 2018. With such embarrassment of riches, it is difficult for companies to evaluate and select the right marketing solutions to power their future state marketing functions. The last few years saw an emergence of some dominant players, many of them are now part of large companies, thanks to the M&A boom in the marketing space. The marketing consulting field is changing with the times. The landscape of digital marketing consulting is on the path to unprecedented change. Today, it is difficult to segment the marketing transformation consultants as the mergers and acquisitions have created conglomerates spanning the spectrum. For high-level marketing strategy, firms like Bain, McKinsey, ZS Associates and other top strategy firms still rule the roost. And there is a wave of consulting firms that are in the customer experience space many of which have been targets of acquisition. The big bold names of strategy consulting are adding design firms to their arsenal. For example, McKinsey acquired Lunar Design, Quantum Black, VLT, and others to create McKinsey Digital. Consulting and IT services firms like Capgemini have gobbled up design firms like Fahrenheit 212, Liquid Hub, Adaptive Lab, Idean, etc. Recently it has launched a new incarnation Capgemini Invent. Big Four firms have been super active as well. Deloitte has acquired Acne, BrandFirst, Magnetic Media, et al. to power Deloitte Digital. While the consultants have trained their M&A sights on design and creative agencies, the design and creative giants are not sitting idle either. For example, Publicis acquired assets like digital specialists such as Sapient Nitro, Digitas, RazorFish, etc. 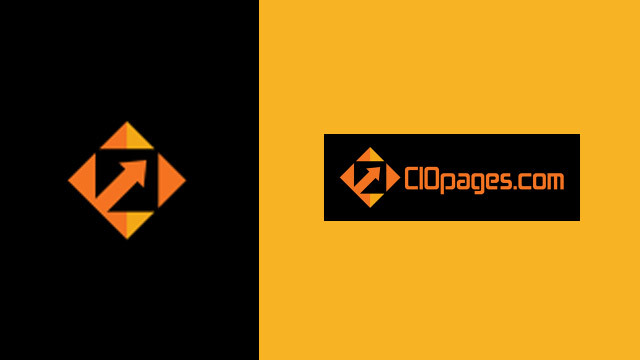 CIOPages.com offers pre-built and customizable marketing transformation deliverables in various formats such as PDFs, PowerPoint presentations, Excel Spreadsheets, and Word documents.